In Tudor times, Middlesex Street was known as Hogs Lane, a pleasant lane lined by hedgerows and elms. It is thought city bakers were allowed to keep pigs in the lane; outside the city wall or possibly that it was an ancient droving trail. The lane's rural nature changed, and by 1590, country cottages stood by the city walls. By 1608, it had become a commercial district where second-hand clothes and bric-à-brac were sold and exchanged, known as 'Peticote Lane'. This was also where the Spanish ambassador had his house, and the area attracted many Spaniards from the reign of James I. Peticote Lane was severely affected by the Great Plague of 1665; the rich fled, and London lost a fifth of its population. Huguenots fleeing persecution arrived in the late 17th century; many settled in the area, and master weavers settled in the new town of Spitalfields. The area already had an association with clothing, with dyeing a local industry. The cloth was pegged out on hooks in the surrounding fields. These were known as tentergrounds. 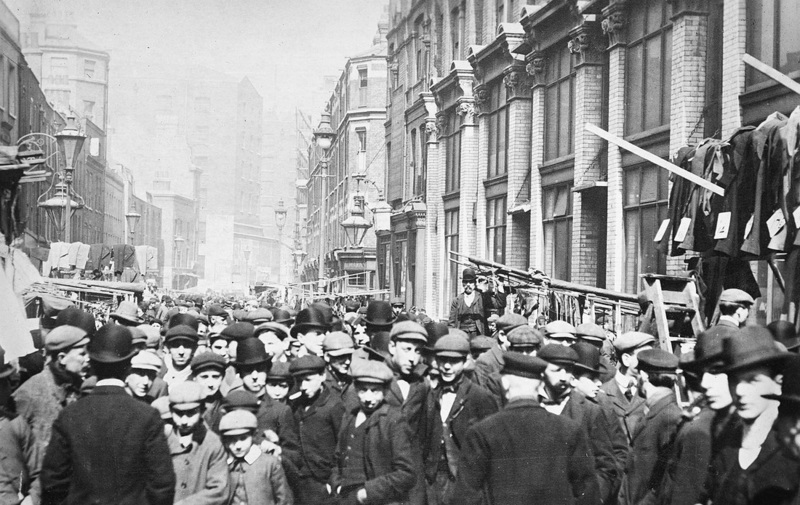 From the mid-18th century, Petticoat Lane became a centre for manufacturing clothes. The market served the well-to-do in the City, selling new garments. About 1830, Peticote Lane's name changed to Middlesex Street, to record the boundary between Portsoken Ward, in the City of London, and Whitechapel, which coincided with the Lane. But the old name continues to be associated with the area. From 1882, a wave of Jewish immigrants fleeing persecution in eastern Europe settled in the area. The chapels, which had previously served the Huguenot community, were adapted as synagogues. Many Jewish relief societies were founded to aid the poor. Jewish immigrants entered the local garment industry and maintained the traditions of the market. The severe damage inflicted throughout the East End during the Blitz and later German bombing of World War II served to disperse the Jewish communities to new areas. The area around Middlesex Street suffered a decline. The market continued to prosper. Beginning in the 1970s, a new wave of immigration from India and east Asia restored the area's vitality - centred on nearby Brick Lane. The first-generation immigrant, Jasbir Sokhal, ran a successful glove stall at the market from 1972 until his death in 2001. The Lane, with alarm bells ringing, to disrupt the market. The rights of the market were finally protected by Act of Parliament in 1936. As late as the 1990s, if Christmas Day fell on a Sunday (which in that decade only occurred in 1994), many of the local Jewish traders would still assert their right to open on a Sunday. 'The Lane' was always renowned for the 'patter' and showmanship of the market traders. Some, selling crockery, would pile an entire setting onto a large plate, and then send the lot, high into the air. Catching the construction on its way down was to demonstrate the skill of the vendor, and the robustness of the porcelain. A prominent businessman, Alan Sugar, got his start as a stall holder in the market. The market remains busy and vibrant, reflecting both its immigrant history and its continuing popularity with locals and tourists.